So she leased a spot in the tiny Northern Lights Bakery (one block down and across the street from its current location) and began delivering lunches to local shop merchants. 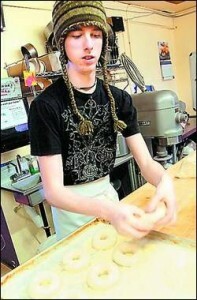 The following year, the bakery owner decided to leave town and offered the business to Rhett (then Angeline Agre). “I figured, ‘Sure, how hard could it be? '” Rhett recalled. 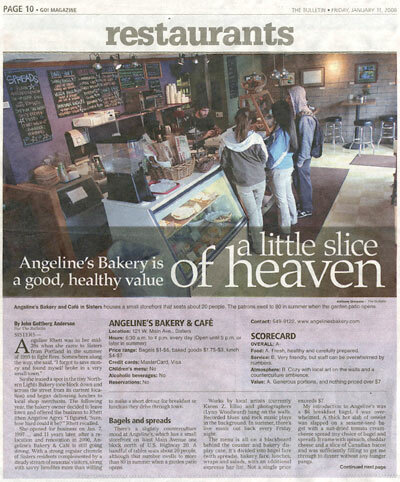 She opened for business on Jan. 7, 1997… and 11 years later, after a relocation and renovation in 2000, Angeline’s Bakery & Café is still going strong. With a strong regular clientele of Sisters residents complemented by a steady stream of seasonal visitors, along with savvy Bendites more than willing to make a short detour for breakfast or lunch as they drive through town. There’s a slightly counterculture mood at Angeline’s, which has a small storefront on West Main Avenue one block north of U.S. Highway 20. A handful of tables seats about 20 people, although that number swells to more than 80 in summer when a garden patio opens. Works by local artists (currently Karen Z. Ellis) and photographers (Lynn Woodward) hang on the walls. Recorded blues and rock music plays in the background. In summer, there’s live music out back every Friday night. The menu is all on a blackboard behind the counter and bakery display case. It’s divided into bagel fare (with spreads), bakery fare, lunches, wraps and salads, with an additional espresso bar list. Not a single price exceeds $7. My introduction to Angeline’s was a $6 breakfast bagel. I was overwhelmed. A thick hot slab of omelet was slapped on a sesame-seed bagel with a sun-dried tomato cream-cheese spread (my choice of bagel and spread). It came with spinach, cheddar cheese and a slice of Canadian bacon and was sufficiently filling to get me through to dinner without any hunger pangs. Angeline’s has a wide selection of hand-rolled bagels and spreads, the latter including avocado-lemon, honey-walnut, smokin’ salmon and cranberry, among numerous others. And the bakery fare — cookies, scones, muffins and a $3 cinnamon roll — keeps people coming back again and again. “I am particularly proud of my carrot-apple-zucchini muffins,” Rhett boasts. The only time I have not been pleased with a visit to Angeline’s is the middle of the lunch hour, when even a short line can become a logjam. On one recent visit, when I was fourth in line, I threw up my hands in exasperation after 10 minutes. The woman in front of me should have been next up, but the two servers behind the counter both had their backs turned away. I returned a few days later and was quickly attended with a smile. For a mere $7, I had a delicious veggie lasagna with a side salad, and again, I was very impressed by the portions. The lasagna was layered with tomato sauce and mozzarella and stuffed with a blend of ricotta cheese, spinach and onions. I would guess that my thick cut was a full sixth of a large baking pan. It would be hard to go hungry at Angeline’s. The accompanying salad of romaine hearts, baby spinach, red cabbage and carrots — as fresh as could be — was dressed with a tangy balsamic vinaigrette (again, several choices are available). The menu of lunch entrees also includes a three-cheese macaroni, spinach quiche, pesto stromboli and chicken enchilada (with black beans and green chiles). Several salads are offered, including albacore and Greek pastas; wraps include curry chicken and Mediterranean tuna. Clearly, the menu is health oriented but not strictly vegetarian. 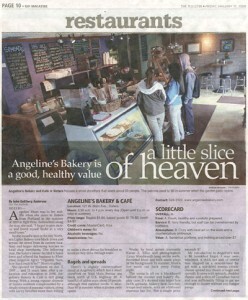 Many of the items served at Angeline’s are made wheat- and gluten-free, including cookies, brownies and fruit scones. Gluten-free sandwich bread is also available. These products are sold around Central Oregon at several outlets: Wild Oats Natural Marketplace, Nature’s General Store, Devore’s Good Food Store and Country Store Health Foods in Bend; Cornucopia in Redmond; Great Earth Natural Foods in Madras; and Harvest Basket in Sisters. They are also sold in Portland, Eugene and other cities, as well as at Fred Meyer stores throughout the Northwest. Food: A. Fresh, healthy and carefully prepared. Service: B. Very friendly, but staff can be overwhelmed by numbers. Atmosphere: B. Cozy with local art on the walls and a counterculture ambience.